First published in 1990, this book presents a discussion with Arthur Miller, in conversation with Christopher Bigsby. Miller talks openly and extensively about his own life and experiences, events and environments which provide material for his plays: his New York childhood, the Depression, the McCarthy witch-hunts. He discusses in depth both the technique of his writing and the moral and political questions which his plays address, and argues passionately for the importance of maintaining respect for human values in a world where they are so frequently transgressed. 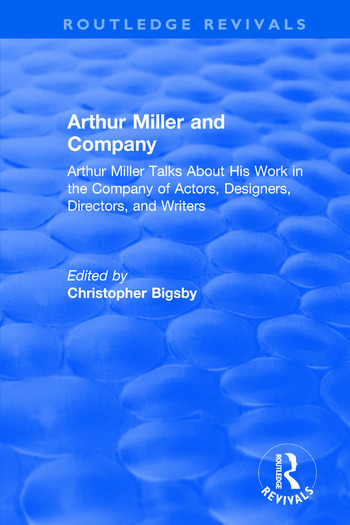 Interwoven with these conversations are contributions from actors, directors, designers, reviewers, and writers who have encountered Miller over the years – whether in person or through his plays – which attest to the universal and enduring importance of his work. Christopher Bigsby, a Fellow of the Royal Society of Literature and the Royal Society of Arts, is an award winning academic, novelist and biographer.